A nice group of three 1912-1915 Edwardian day dresses. The first dress is made of peach silk. 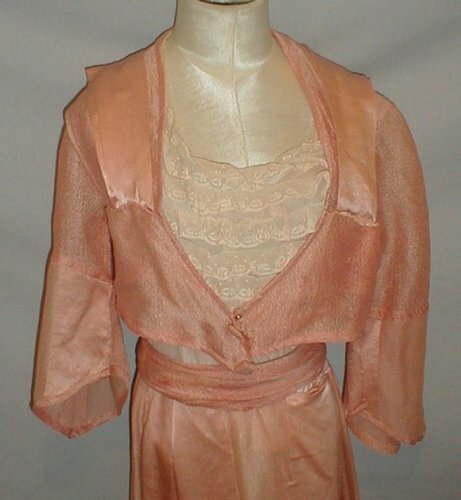 The front of the bodice has a lace insert. The dress is trimmed with decorative buttons. The dress has a separate jacket. There is no underarm discoloration or age spotting. 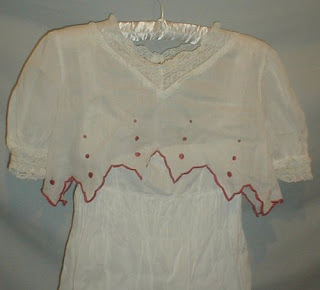 There are scattered small pea size holes and a few ½ splits in the fabric. There are a few missing snaps and hooks and eyes on the front closure. Bust 32 Waist 24 Skirt length 38. 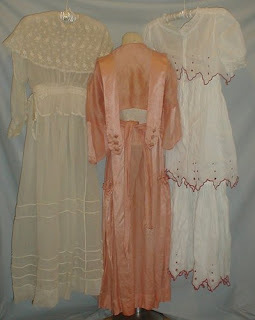 The second dress is made of white silk chiffon. 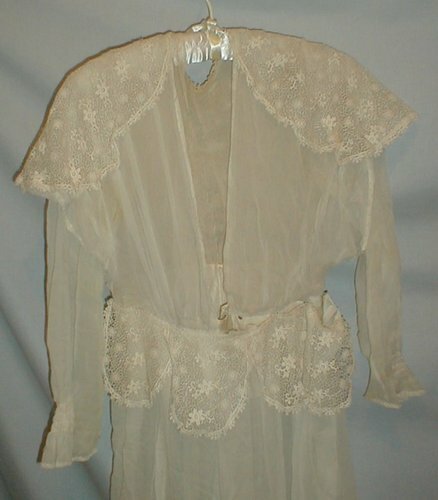 It has a wide lace shawl style collar and lace trimming at the front waist. There is slight underarm discoloration, no age spotting and no holes. The snaps are missing on the front closure. Bust 34 Waist 28 Skirt length 37. The third dress is made of white cotton and trimmed with dark pink embroidery. It comes with a separate jacket. The jacket is trimmed with lace. The skirt is designed with two tiers. The dress and jacket have a back snap closure. There is no underarm discoloration or age spotting. There are a couple of pencil tip size holes. Bust 34 Waist 28 Skirt length 37. 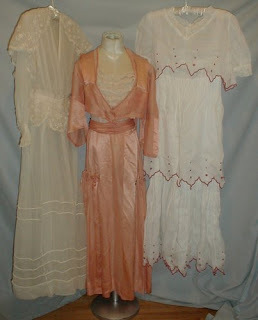 I honestly think, based upon the sleeve design, the white and red dress is from the 1930's. The other two are early to mid Teens Era dresses.